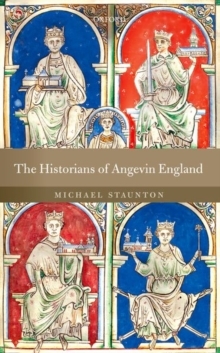 The Historians of Angevin England is a study of the explosion of creativity in historical writing in England in the late twelfth and early thirteenth centuries, and what this tells us about the writing of history in the middle ages. Many of those who wrote history under the Angevin kings of England chose as their subject the events of their own time, and explained that they did so simply because their own times were so interesting and eventful. This was the age of Henry II and Thomas Becket, Eleanor of Aquitaine and Richard the Lionheart, the invasion of Ireland and the Third Crusade, and our knowledge and impression of the period is to a great extent based on these contemporary histories. The writers in question - Rogerof Howden, Ralph of Diceto, William of Newburgh, Gerald of Wales, and Gervase of Canterbury, to name a few - wrote history that is not quite like anything written in England before. Remarkable for its variety, its historical and literary quality, its use of evidence and its narrative power, this hasbeen called a 'golden age' of historical writing in England. The Historians of Angevin England, the first volume to address the subject, sets out to illustrate the historiographical achievements of this period, and to provide a sense of how these writers wrote, and their idea of history. But it is also about how medieval intellectuals thought and wrote about a range of topics: the rise and fall of kings, victory and defeat in battle, church and government, and attitudes to women,heretics, and foreigners.